Bianca and I skied through Chevak, giving permission slips to the kids out playing, hoping that they would come to the school around 2 so that they could ski. Kate waited at the school to await the kids while Robyn and Jonathan got skis set up. Around 30 kids showed up from 2-3 and eventually everyone got on skis. We played tag with a rubber ball we found and everyone had a lot of fun in the sun, learning how to move around. Each class came and played wolves and caribou (an instant favorite) and even kids that struggled to move joined in and had a ton of fun. We focused on teaching the kids how to put on their skis, move around, and hold them in the air when bringing them back. We also taught the younger grades the “dead bug” pose when trying to get up. After school, we let anyone come that wanted to…. And most kids did, which caused chaos because kids were waiting in line to get equipment, but the kids on skis wanted to keep skiing rather than give them to the other kids. Kate and Bianca were also stuck inside the whole time, setting up the kids with skis. After that, we decided to split up after school into girls only and boys only. At the beginning of the day, we had 6th graders, who were getting good on skis, even on the 2nd day. There were fewer of them, so it was mostly small groups or one on one, and we skied a loop on the lake. During the 7/8th grade class, we brought out the sit ski and Chandler was exceptional with it. He slid down the hill and only needed a bit of help at the top of hills. It was a bit chilly, and Chandler had to go in a bit early, but he had still had a lot of fun playing wolves and caribou with the other kids. The kindergarten class(es) loved sliding down hills repeatedly and didn’t get the concept of wolves and caribou, so we stuck to letting them roam and go down the hills. After School the girls played wolves and caribou… everyone was obsessed with this game. Even though it was only girls, there was still a shortage of skis and boots, so we had to switch halfway through our time and let the other set of girls go. Some of the girls, however, stuck around and played tag with us on foot. We introduced a slalom course for the 6, 7 / 8, and 9th graders. They loved it and wanted to master it. We also started the older grades on a loop around the school as a “warmup” and then played, wait for it… Wolves and caribou. Even when we ask the kids what they want to play, their response is always “WOLVES AND CARIBOU”! After school the boys that showed up were well behaved and waited somewhat patiently in line. Chandler showed up and was excited to get on skis. Although there were less boys that came then the girls the previous day, they were a handful, always trying to explore further and we had to herd them back to a smaller area. The older grades (which were always in the chilly mornings) skied around the school and then slalomed for a while, and then played wolves and caribou. We gave them poles, but they did not like them while they were skiing. They are sad that Friday is going to be our last day skiing with them. The younger grades are equally (or even more so) sad that that we had to leave, but none the less, they had a ton of fun roaming the area, playing tag, and trying a slalom. After school, we hosted the girls race after school. Again, we had to groups of girls, so the first group raced down the lake to a set of cones, stopped and waited for my signal, and then raced back. They headed inside, where Bianca was waiting with Skiku buffs as a prize. Kate setup the other set of girls as soon as she could and before I knew it, another set of racers were eagerly awaiting the chance to race. 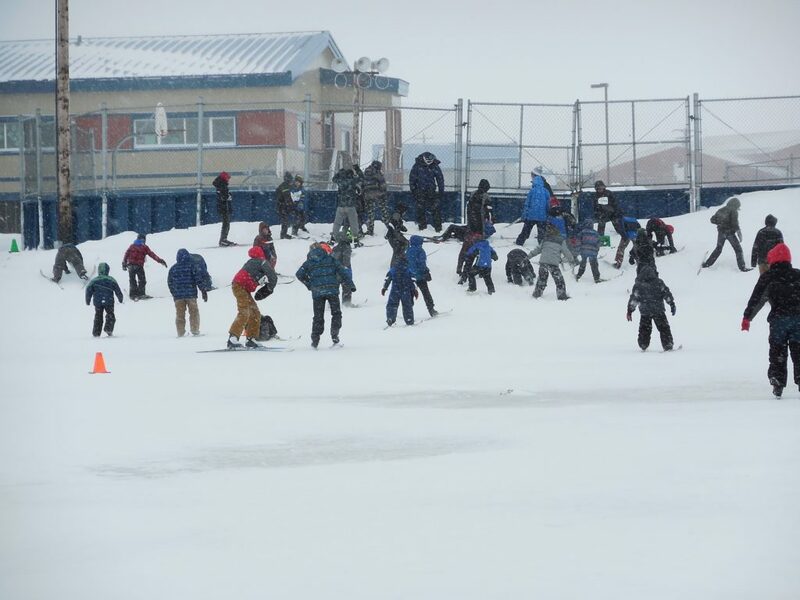 It snowed the whole day, but that didn’t stop the kids from skiing and having fun. The kids mostly wanted to ski down the hills with the new snow. The ninth graders skied to the other side of the lake, towards the town store, making a large loop. We gave the ninth graders poles again, and they enjoyed them more than the other grades. We spent the day playing games with all the grades. Fifth grade were especially sad to know we were leaving in less than 24 hours. We skied down hills and messed around. It continued to snow and the wind picked up before the after-school ski. The boys were super excited about racing, but waited patiently in line until everyone had boots and skis. We headed outside and raced. The racecourse was different from the girls’, with a big uphill one way and a big downhill the other way. The boys headed in, tired and happy, and got a Skiku buff from Bianca. We then set up the skis with instructions on how to make a rack, how to wax, and how to distribute them. The teachers and kids in this village plan on skiing every chance they get! Thank you for this amazing trip! I always love to teach the kids how to ski, and they always pick up the skills fast enough to play games (like Wolves and Caribou) within the first day. Chevak was a great village to visit! Because we got there on Saturday, we got to experience some Cup’ik culture. After skiing the town, we went to the community center and watched native dancing! Chevak and the nearby villages were having their annual Winterfest and had tons of dancing for us to enjoy. The teachers in Chevak love the idea of their kids skiing and want to start an after-school club/program. We left them many pairs of skis and had confirmation that at least one teacher was going to “force” her kids outside during their gym period to ski. Teachers almost always came out with their class and learned how to ski with us. As soon as we arrived, there were kids asking us if we were “the ski people” and told us that they learned how to ski the previous year and couldn’t wait to go skiing again. This is the enthusiasm that made the whole trip amazing! Rarely was a kid upset about having to go skiing and we had so many interested in the after-school skiing that we had to split up the kids into groups that everyone got a turn to go outside and play on the skis.